The superhero heads in this drawing are another appropriation (as in Ant-Man), taken from comic book artist John Buscema's cover to Marvel Super Action #21 (reprinted from Avengers #60). 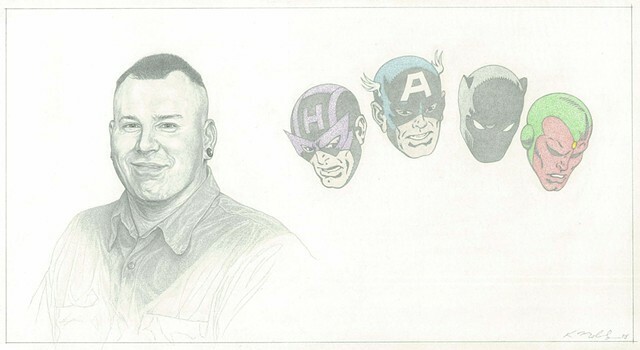 I have often regretted adhering so strictly to Buscema's scheme, wishing that I had replaced the Vision head (far right) with a hero whose color scheme complemented the violet and blue of Hawkeye and Captain America (respectively). I thought I knew what I was doing at the time--that the red/green color combo of the Vision's head would finish off the check-mark composition of the drawing with zing . . . but it didn't quite work that way. Still, I'm happy that I had the courage to experiment, and I still really love this drawing!